Happy Friday! For those of us in Canada our taxes are due today, hope you get yours in on time! It's a HUGE Friday in the Stampin' Up! world because so many sales and promotions end today to make room for fantastic ones tomorrow! The Occasions Mini Catalogue ENDS TODAY!! Click HERE to see our catalogues!! Note: Our Build-a-bear line, Big Shot dies, satin ribbon, new punches, Vintage Vogue Stamp Set and Tiny Tags stamp set will still be available.... phew! The Two-Step Into Spring Promotion ends today as well! This very popular promotion features the NEW upcoming Awash with Flowers stamp set won't be available again until July 1st! This is the amazing two-step stamp set I have been featuring all month long in my classes and workshops. 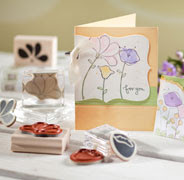 Two-Step Into Spring 20% off the following 4 stamp sets ENDS TODAY as well! SAVE NOW and stock up on some beautiful stamp sets! My favourites are Fifth Avenue Floral and Greenhouse Garden!! Why pay 20% more tomorrow?? We've partnered with Country Living magazine to offer this exclusive Cards à la Carte stationery kit. 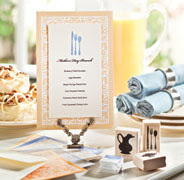 With 24 sheets of uniquely-designed 5-1/2" x 8-1/2" printed paper, this kit has everything you need to create a one-of-a-kind dinner menu or handwritten letter. I truly appreciate your business and thoroughly enjoy being available to answer questions or assist you with ordering Stampin' Up! products! I'll be available by phone or EMAIL all day if you'd like help placing an order or have questions about products! Two Step Stamping week! This card to me screams - move over Spring here comes SUMMER! I felt this card was very important since this week we had snow! Brr. 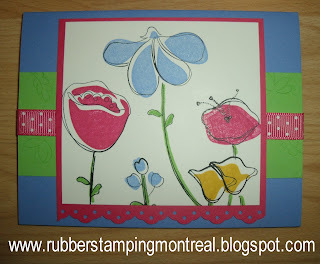 All April long my classes have featured Stampin' Up's new Awash with Flowers Stamp set. it will be available for purchase in July with the launch of the new 2010-2011 Idea Book and Catalogue! 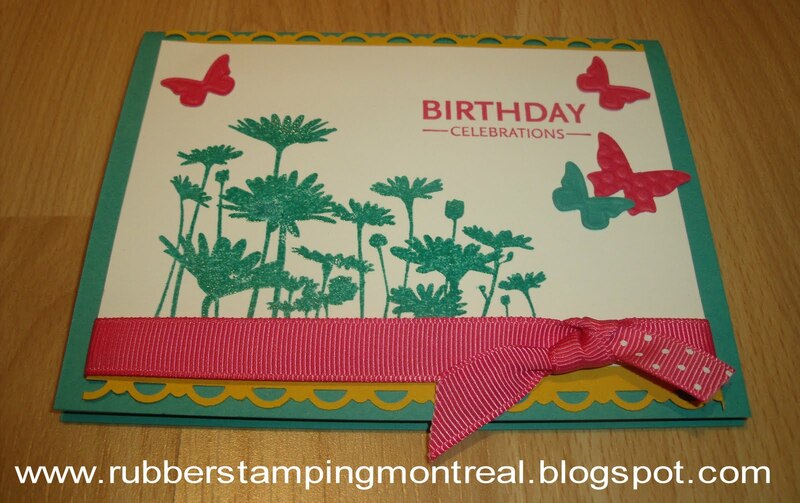 heat embossing, dry embossing, two step stamping, fun folds and more! on how to register for my classes at the Montreal West Island's Women's Centre . Classes are held 1-3pm on Thursdays until May 27th, 2010. The card shown above is one we will be creating this week! Note: Registration is ongoing as there are a few spots still left in the course. REGISTRATION STILL OPEN for my 6 Weeks of Technique Classes! Classes are held 1-3pm on Thursdays from April 22 - May 27th, 2010. Note: If there is still room available in the course you are able to join in week 2 or 3. 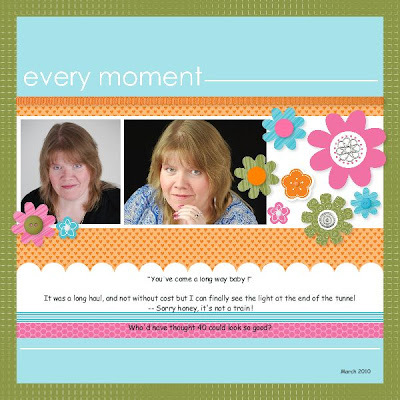 Here are two of the lastest My Digital Studio layouts that I created last week when I was showing my friend Tammy just how easy it is to use the software! She of course is the beautiful woman (and adorable child) in the photos! There is nothing like taking the time to celebrate YOU! Often we spend so much time scrapbooking the kids, our family etc.. you forget about yourself! 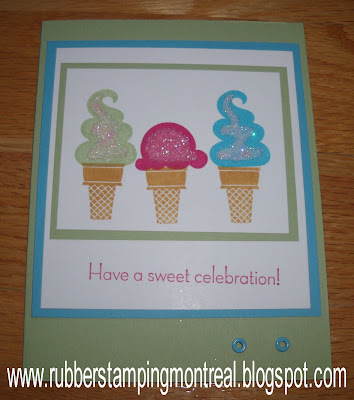 Sweet Scoops sneak peek from Stampin' Up! 's Summer Mini 2010. I stamped the weekend away and just can't wait to show you a couple of my creations!!! Oh my goodness how I LOVE LOVE LOVE this new stamp set !! Its available starting May 1st in the upcoming Summer Mini 2010 ! Its Stampin' Up! 's new Sweet Scoops Stamp Set! Yes of course, if you book a party or attend a class of mine in May or June you will absolutely make this card or one similar to it! 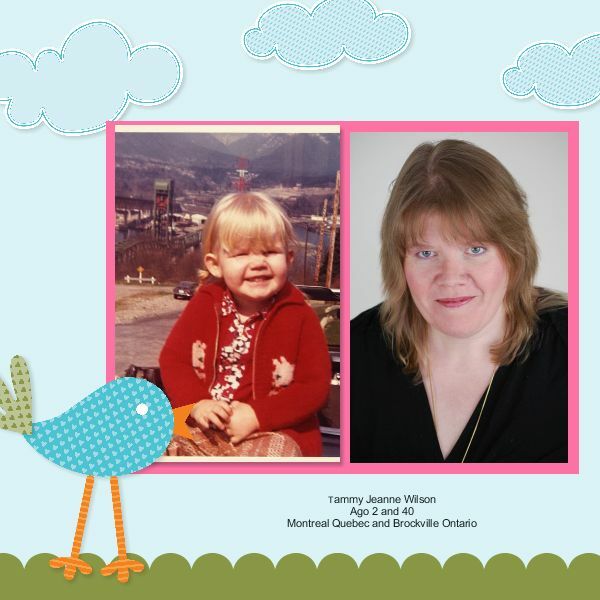 Did you know I teach classes and workshops in Ottawa, Montreal and all the towns in between? Of course I take customer orders as well! To join Stampin' Up! for an awesome discount or for a fantastic business... contact me today! 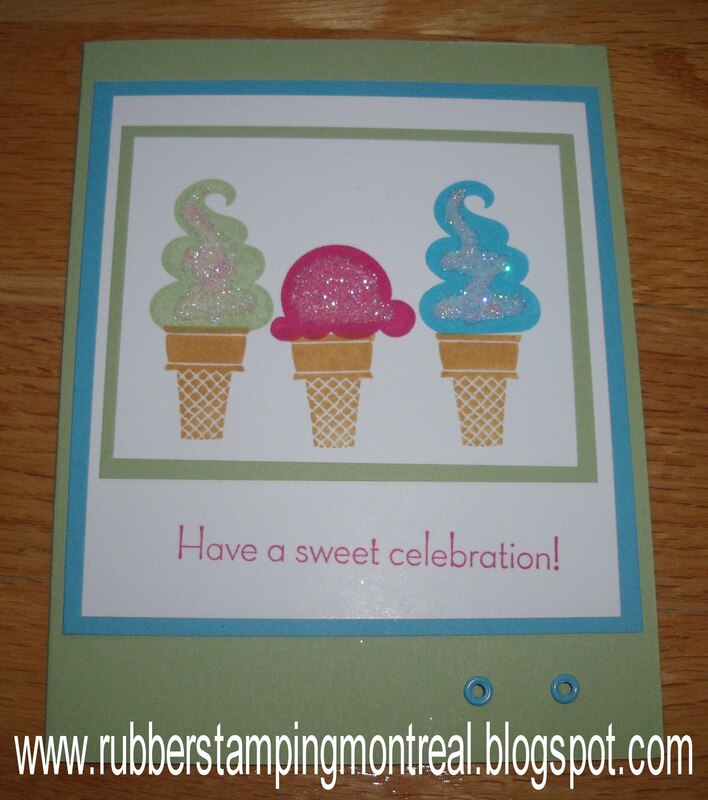 INSIDE SCOOP - Stampin' Up! Style! Some absolutely fantastic hot-off-the-press news is that Stampin' Up! is completely renovating their colour selection in July 2010 with the launch of the 2010-2011 new catalogue! Trust me - you do NOT want to wait to order extras of your favourite colours in cardstock, re-inkers and markers, as they will be retiring! INTRODUCING the July 1st, 2010 Stampin' Up! Colour Families!! …..
*Crumb Cake is our current specialty colour Kraft. **Blush Blossom will continue to be available in Marker form. On top of this, we will continue to get 5 new In-Colors each year for two years as opposed to one! This means that for our 2010-2011 catalogue, we will have 45 colours made up of the four collections listed above and 5 In-Colors, than in 2011-2012 catalogue those In-Colors will stay for one more year and we will receive 5 more! A total of 50 colours on a yearly basis to mix & match to our heart’s content! Yay!! Of course to make way for the new, we’ll be saying goodbye to some of our old favourites. Make sure you get them before they’re gone! Cardstock, ink, reinkers! Workshops, Classes, Gift Certificates and more... I'm here to help! Stampin' Up! 's Two-Step Stampin' sets allow you to quickly and easily take your creativity to the next level. 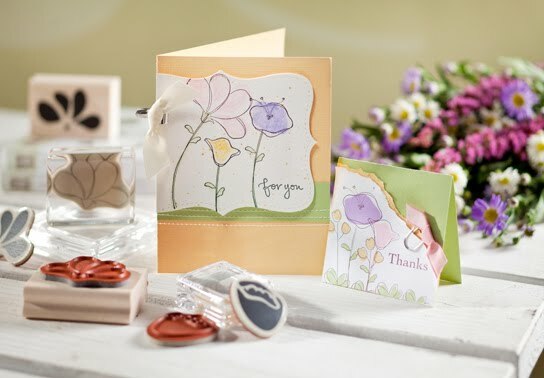 And now, from April 1-30, 2010 only, you can purchase the brand-new Awash with Flowers Two-Step Stampin' set--or get it FREE when you host a $460 workshop! The sample above features this set and its BEAUTIFUL! 20% OFF these 4 Beautiful Sets!!!! Are you in the Montreal area? I will be teaching 6 weeks of technique classes on the West Island of Montreal Thursday afternoons from 1-3pm beginning April 20th! Registration is still open! Contact me for more details!